WASHINGTON — Four Republican senators say they will not vote for the GOP health care bill unless changes are made, putting passage of the bill at risk just hours after it was unveiled. With Republicans holding 52 seats in the Senate and no Democrats expected to support the legislation, GOP leaders can only afford to lose two votes among their own ranks. "Currently, for a variety of reasons, we are not ready to vote for this bill, but we are open to negotiation and obtaining more information before it is brought to the floor. There are provisions in this draft that represent an improvement to our current healthcare system but it does not appear this draft as written will accomplish the most important promise that we made to Americans: to repeal Obamacare and lower their healthcare costs." "It looks like a reiteration or a keeping of Obamacare," Sen. Paul told reporters Thursday afternoon. "I'm a 'no' on the bill currently." 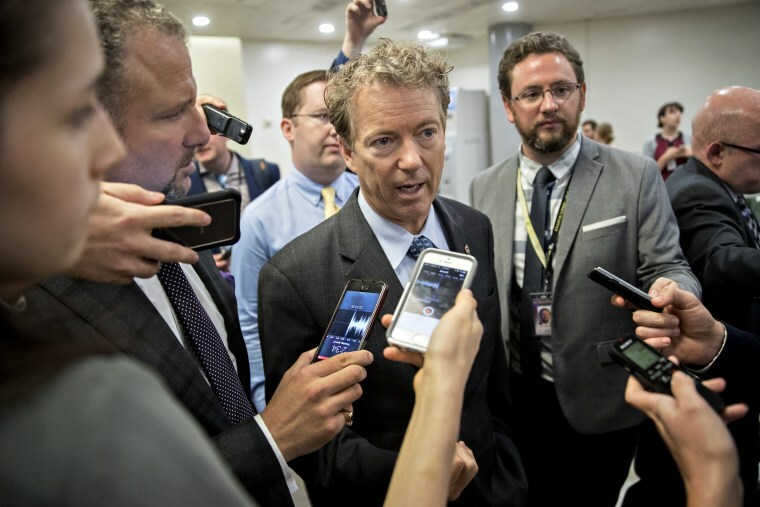 Paul said the group came out together because they'd have more negotiating power to move the bill in a more conservative direction. Their displeasure includes the amount of subsidies given to people to purchase insurance, the Medicaid expansion continues for another three years and the $15 billion per year to prop up the insurance companies providing insurance in the individual Obamacare market for the next three years. Cruz struck a conciliatory note, saying, "this current draft doesn’t get the job done, but I believe we can get to yes, I believe we can get this done." In an interview with Fox News Channel that aired Friday morning, President Donald Trump said the senators are "four good guys and they're four friends of mine and I think that they'll probably get there." "We have four very good people," the president said. "It's not that they're opposed, it's that they'd like to get certain changes. And I'll see if we can take care of that." Outside conservative political groups have also begun voicing their opposition, a move that could make it harder for the most right-leaning senators to come on board. "Leader Mitch McConnell even said he would repeal Obamacare root and branch," said Adam Brandon, president of FreedomWorks, a Tea Party organization, in a statement. "This bill, however, breaks those promises." Many of the Senate's Republican members got their first look at the draft of the bill in a meeting Thursday morning and few emerged praising the bill's contents, with many reserving their comments until they have more time to absorb the details. But if the bill moves further to the right, they run the risk of losing moderates, who also aren't pleased with the bill. Sen. Rob Portman, R-Ohio, who was a member of the 13-member working group who laid the groundwork for this bill, said that he also has concerns. "There are some promising changes to reduce premiums in the individual insurance market, but I continue to have real concerns about the Medicaid policies in this bill, especially those that impact drug treatment at a time when Ohio is facing an opioid epidemic," Portman said in a statement. Sen. Lisa Murkowski, R-Alaska, said that she is going to look closely at the Medicaid portion of the bill, which she said should cover the people who need it in her state. She also said that she's considering addressing an the bill's defunding of Planned Parenthood. "If I need to draft up an amendment to Planned Parenthood, then that would be one to include in the mix," Murkowski said. "It’s incumbent upon me to do my due diligence." Sen. John Cornyn, R-Texas, the second-ranking member in the Senate, said the bill is "not a final product." "The discussion draft is sort of a best guess of where the Republican conference is, but people have other things they want to see in the bill," he said. "We've got members who are going to be interested in looking at the text and looking to see what they can do to refine and improve and dial things accordingly to try and figure out how we get 50 votes," said Sen. John Thune, R-S.D. But most senators refused to comment on the bill, saying as they left the Capitol for the week that they needed to ask their governors and officials in their state how it would affect them. "My first obligation is to make sure that what we are replacing Obamacare with is better than what's happening in Florida now and that's what I'm in the process of figuring out," Sen. Marco Rubio, R-Florida, said. "We'll see if two days, three days is enough time. It may, it may not be."